ArabLit: In your stories, how do you see the relationship is between Arabic / Arabics and English / Englishes? You choose the convention of italicizing certain Arabic words, for instance, which makes them stand out. Where & how else do you see Arabic here? Mai al-Nakib: Although I write in English, the stories convey a landscape and cultural sensibility that is, at least in part, Arab, and so Arabic weaves its way into the English as a matter of course. Arabic names and words are the most obvious examples, but Arabic also comes through in the cadences of some of the dialogue (in “Echo Twins” and “Amerika’s Box”). The publishing convention of italicizing non-English words (Arabic or otherwise) in English texts is convenient, although, as you imply, it does make them stand out as “foreign.” I am particularly interested in the contrast between what non-Arab readers might experience as foreign or strange (italicized words, unfamiliar names, peculiar situations), on the one hand, and ordinary experiences (of adolescent love or midlife crises) expressed in familiar language, on the other. English reflects the reality of many of us living between worlds, even if we happen to live in one place physically. English also reflects a specific reality of the Middle East — its colonial history, its globalized present. It is, therefore, both appropriate and inevitable that English will be utilized by contemporary Arab writers living in the Middle East and not just by those who immigrate to the UK, the US, Canada, or Australia. This is happening more and more, and it will be interesting to consider how such writers and their works will or will not fit into the local and regional cultural context. These issues are certainly not new and will parallel some of those that come up in relation to Indian or African writers who choose to write in English (in India or Africa respectively). AL: I assume you’re writing for a primarily non-Kuwaiti audience. Do you feel the need to explain things that you wouldn’t have to explain if you weren’t writing for a global audience? (On a very obvious level, that Iskander is the Arabic form of Alexander…but on a broader level as well.) How does it change your writing? MN: As I was writing these stories, I didn’t think too much about audience at first, neither local nor global. Writing in English automatically (and paradoxically) both restricts and expands my audience. But I didn’t really have much of a choice about that since English is my first language, the only language I can use to write fiction. Having to explain nuances about Arabic or Arab culture in English doesn’t feel forced or awkward to me and certainly does not affect the way I write. Defining unfamiliar names, like Ghalia or Iskander, or words, like mejnooneh (bougainvillea/crazy), can be helpful to an English-speaking audience. But highlighting specific names and words can also make them seem unfamilar or new to those who know Arabic. So, in fact, for both sets of readers, the names and words become both familiar and unfamiliar at the same time. It was completely baffling to me that so few seemed to remember the Kuwait that I (and my parents and even their parents) had grown up in: a cosmopolitan, heterogeneous, outward-looking, and adventurous Kuwait. A few stories into the collection, it started to become clear to me that I was writing, at least in part, to a small group of people — both Kuwaiti and non-Kuwaiti — that came of age in Kuwait in the 1980s, particularly those who went to international schools there. One of the reasons I felt so compelled to write these stories was as a way to register and try to make some sense out of the acute changes the country had undergone since 1990 and especially after 2001. It seemed to me like those abrupt changes had triggered a state of amnesia among the Kuwaiti population. It was completely baffling to me that so few seemed to remember the Kuwait that I (and my parents and even their parents) had grown up in: a cosmopolitan, heterogeneous, outward-looking, and adventurous Kuwait. A Kuwait open to Palestinians, to Christians, to Indians, to some of the more progressive features the West had to offer (democratic institutions, educational programs, innovative architecture, social welfare systems, etc.). A Kuwait not just tolerant of difference, but enthusiastic about it, welcoming it with open arms. The complete erasure of this version of Kuwait felt incredibly stifling and disorienting to me. In some ways, keeping my small audience in mind made it possible for me to continue. I kept telling myself: “Surely they will remember it the way I do.” As it turns out, I wasn’t wrong. Far-flung friends have confirmed to me that they do remember that version of Kuwait — with fondness and regret. AL: Do you have a relationship to the Kuwaiti literary scene? What’s been the reception of your work in Kuwait? Among other writers, by local critics? Do you follow the Kuwaiti literary scene? MN: Over the course of the various events linked to the launch of my book in Kuwait this April, I had the generous support of many members of the cultural community. Reviews in Kuwaiti newspapers and magazines, both English and Arabic, have been positive. I’ve been asked to present this fall (on the issue of writing in English as a Kuwaiti writer) at the monthly literary diwaniyya of prominent Kuwaiti author and cultural critic, Taleb Al-Refai, which I’m thrilled about. 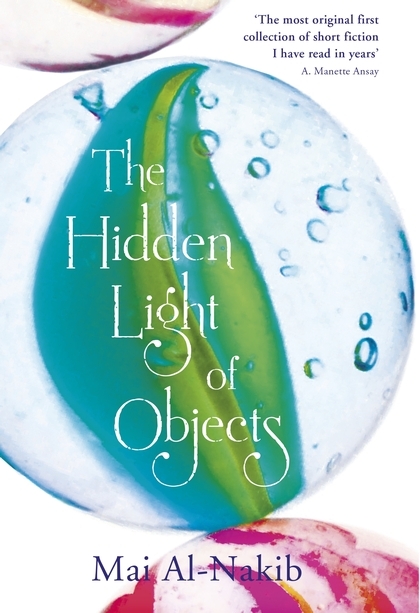 I’m grateful and touched by the kind things people have been saying about The Hidden Light of Objects in my home town. I first read Ahdaf Soueif’s remarkable novel In the Eye of the Sun when I was about twenty-three. It was for me one of those rare books that changed my sense of what was possible. I read that book with the same wonder and delight as I had read The Wizard of Oz as a child. For the moment, I don’t have a close relationship with the literary scene in Kuwait, but perhaps this will change. I tend not to follow literary scenes in the region (or anywhere else) too closely because I don’t want to feel that kind of influence. I need to be extremely strict about preserving a removed space for my writing; this is especially vital since I teach literature for a living! I read books by writers I love or am interested in from all over the world, including Kuwait, but not because they are part of any given scene. AL: What are your writing community/communities, and what writing histories & dialogues do you see yourself as being a part of? MN: I see myself as part of the growing community of Arab writers who write in English; more specifically, a group of Arab women writers who write in English. I first read Ahdaf Soueif’s remarkable novel In the Eye of the Sun when I was about twenty-three. It was for me one of those rare books that changed my sense of what was possible. I read that book with the same wonder and delight as I had read The Wizard of Oz as a child. It was the first time I saw my reality expressed in what I thought of (and continue to think of) as my language. For that I will be eternally grateful to Soueif, a writer I recommend to all my students, a writer whose short stories I continue to teach with joy. Writers like Ahdaf Soueif, Selma Dabbagh, Hanan Al-Shaykh, Fadia Faqir, and Diana Abu-Jaber, among others, make up the community of Arab women writers I see myself in dialogue with. Writers, Arab or otherwise, who express the singular experience of inhabiting the in-between embody a community I feel a great affinity with: writers like Kafka and Emile Habibi; Rushdie and Yasmine Zahran; Ghassan Kanafani and Assia Djebar. Postcolonial writers, diasporic writers, exilic writers — the writers I most admire, the writers who have shaped my life as a scholar of comparative literature and postcolonial studies. But perhaps above all, I feel I am in private dialogue with the group of experimental writers I have loved since I was a teenager: modernists like Joyce, Woolf, Kafka, Proust, Rhys, and Beckett, among others. A modernist sensibility — intransigent, experimental, unapologetic, paradoxically engaged with both a memory of the past and the possibilities of the future — speaks to me most strongly, despite its well-known pitfalls. From a different angle, even in my fiction I am concerned with the theoretical ideas that inform my academic scholarship: the work of Deleuze and Guattari, especially, but also Walter Benjamin, Adorno, Nietzsche, Spinoza, Edward Said, and others. In addition, the shadow boxes of Joseph Cornell and the memory experiments of Christian Boltanski always inform my writing (I’ve come to realize the vignettes in The Hidden Light of Objects are my version of Cornell’s boxes). AL: Are you interested in having the collection translated into Arabic? What do you think that process would look like? English in the Arab world can open up an alternative perspective, a different version of life, as it does for young Amerika (in the story “Amerika’s Box”). But having that version expressed in Arabic might be hard for some to swallow. However, I’ve come to believe it is both urgent and necessary to present it (expose it?) anyway. I look forward to having the collection translated into Arabic and plan to communicate closely with whoever ends up doing it. A poet, I hope. AL: You said in a May interview with The National that you were “quite optimistic about the future.” And indeed, your stories feel — on the balance — optimistic. Do you mean Kuwait’s future in particular? Do you still feel optimisic? MN: I wrote the stories that compose The Hidden Light of Objects after 9/11, a dark time in Kuwait and elsewhere in the region. The stories are themselves, in many ways, dark, but the book ends with a small degree of optimism, a window to an alternative, slightly improved state of things. Today, no one in the region can be optimistic about the future. With the unfolding catastrophes in Iraq, Syria, Gaza, and elsewhere, it’s just not possible. At the same time, I remain hopeful that small, unexpected bubbles of promise will continue to rise, as they always have. These moments or events or creations — the things people do not only to survive but to make things better — provide comfort and, beyond that, prepare the conditions for a different future than the one currently being mapped out for us by forces determined to annihilate optimism. If we allow our optimism, contained and cautious though it may be, to disappear altogether, we are abdicating our right to the future. I, for one, refuse to do that.